Tattoo inspired jewellery makes a refreshing change from the usual collection and this cool Sailor Jerry style swallow necklace from Tatty Devine is just perfect for adding a swoop of stand out style. 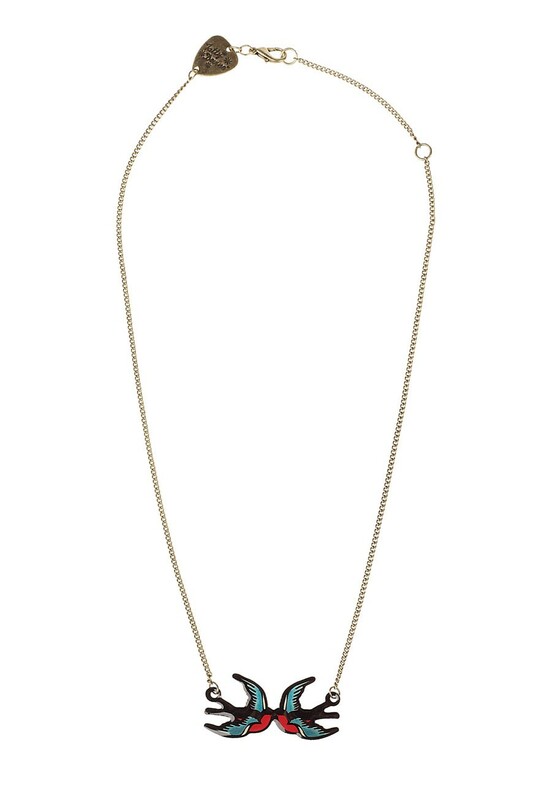 Not only does this satisfy every fashionista's craving for bird necklaces, the kissing swallows on this necklace make it the perfect pressie for the one you love too. We love this vintage style necklace teamed with a floral prom for a kooky, contrasting combination. This is an enamel pendant of two swallows (4 x 2 cm) meeting in flight in blue, black and red held on an adjustable silver tone alloy chain measuring a max of 50cm.